David is in highest demand as a chamber and orchestral musician and is a member of several professional level string quartets in L.A. and Santa Barbara. David can be seen on the television series Hell’s Kitchen and The Amazing Race. 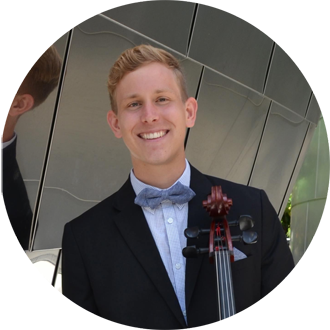 He received his Bachelor of the Arts in Cello Performance from California Lutheran University and graduated with a Master’s degree from California Institute of the Arts. David has been featured as a soloist and section cellist for the score of documentary film With Great Power: The Stan Lee Story which was recorded at Capitol Records in Los Angeles. David has performed with artists such as Burt Bacharach with the Corona Pops Orchestra, Michael W. Smith, and Vinnie Ferra. He is a section cellist of the Bakersfield Symphony Orchestra and has performed in Carnegie Hall, Royce Hall, the Fox Theatre in Riverside, and the Granada.